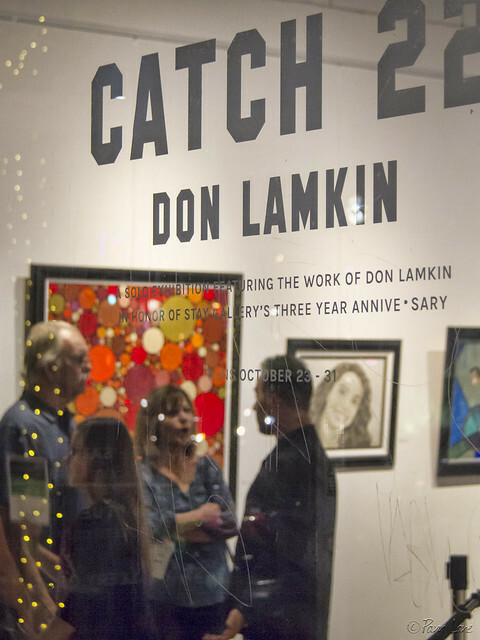 The Stay Gallery is celebrating its third anniversary with a solo show of Don Lamkin's art works. Don has been a great supporter of the gallery, and the arts in Downey in general, for many years now. Don is best known for his Downey Doodle-icious painting. The Doodle-icious style was something he happened upon accidentally. He writes, "It was never intended to be more than a simple doodle. [It] was created while watching TV on a 6"x12" canvas given to me by a friend because 'it was too small to do anything meaningful on.'" When a friend liked the painting, he made another one in the same style, but filled it with the things that were meaningful to her. As you can see in the picture to the right, you can look a long time and still not see it all. 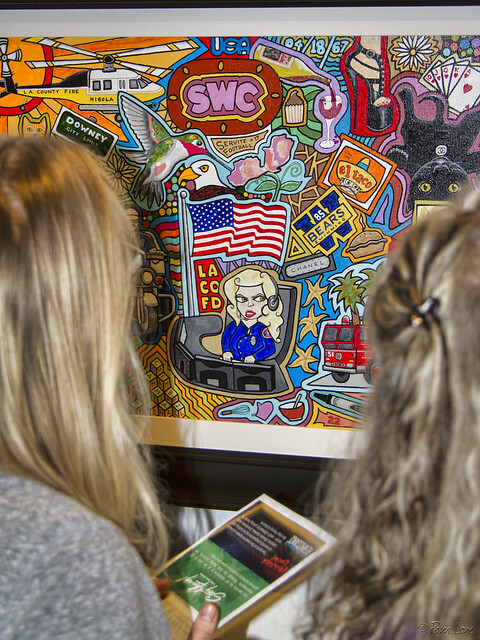 The Downey Doodle-icious painting was created as a raffle item for the annual Downey street fair, to raise money for the Downey Museum of Art. After it was recreated as the mural in downtown Downey, other cities came calling, looking for someone to create a mural to celebrate their own history and landmarks. Don doesn't consider himself an artist. He says he doesn't have the typical artist personality. "I'm on time. I'm not sensitive." But, he says, "I find it very interesting and fun to research, design, compose, and execute these doodle-icious art pieces."